We measure our clothes by laying them flat. The majority of our clothes are sized to suit petite women due to the variety of brands. 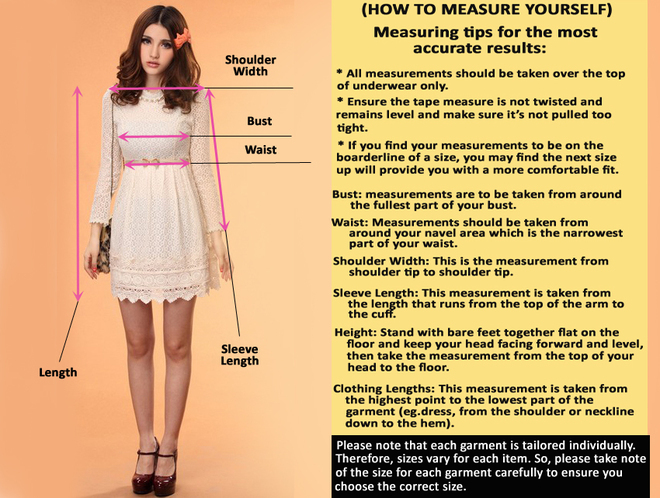 We have listed the exact measurement for each item to help you choose the correct size. On each product page, you’ll find our recommended size fittings for that specific garment, so please make sure you read the product description before making a purchase. If you require specific measurements or could not find your size from our stock, from click the “Notify Me on Restock” button from the product page and follow the instructions. After you have done so, we will notify you via email when your chosen size is back in stock. Should you need further assistance or have more questions, please contact us and we’ll be happy to help.